warning: Creating default object from empty value in /home/globalfi/public_html/modules/taxonomy/taxonomy.pages.inc on line 33. Efi Amanatidou’s installation deals with the polarised relationship of life and death. This is structurally objectified by the juxtaposition of the inside and the outside as well as the potential to observe part of the installation being blocked at the outside, while at the same time another part of it invites the viewer to its inner space. The red room -pain's field- and its inverse/reflection moorder-murder is the inside or the outside? της τον προσκαλεί στο εσωτερικό του. of the sea's surface, and the sound of the lap of the waves at the seashore. carrying symbolical connotations in relation to the meaning of the installation. 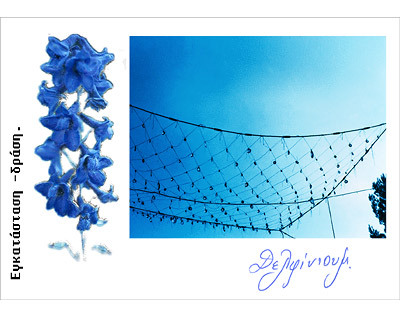 The blue-coloured flower "delphinium" has the structure of a main branch from which the blossoms set. the viewer in touch both with her and her idea. of sand and the use of mirrors and music. "This is the place where all roads meet..."
Then the music of my CD-rom came in my mind. I never want to leave"
does not occur only after losing something but even before coming close. How can we, humans break the distance? I will try through art. and life a substitute of the place where all roads meet?" 4) Documents from the basement of the building. 5) Whatever else evolves, it is a material in process !